If you haven’t seen the entire third season of Lost, do not continue reading because there will be spoilers. You still here? Sure you want to read? Ok, then. 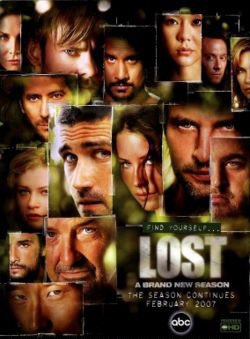 As you might be aware of, I’m a huge Lost fan and follow the show dedicatedly. I liked the show from get-go, and while others have gotten disappointed in not explanation, I thrive in all the mysteries. Yesterday I was blown away when watching the season finale of the third season, and I thought I’d share and discuss some things with you. Lots of other people die. That Locke survived wasn’t a shocker, since he is definitely a vital part of the series. Love the character, love the actor. Walt’s comeback was good, and I expect Michael to also make some kind of appearance in season 4. Lots of death in the episode, with a number of the Others (especially Tom), Naomi and Mikhail getting killed. Mikhail came back from one previous “death”, though, so one never knows. Jack and Juliet kissing was probably just a matter of time, but I wonder where it will lead. Will it be Sawyer and Kate, and Jack and Juliet (probably not the latter, given the flash-forward and Jack’s state)? The most genius part of the finale is the ending, where it’s revealed that all the scenes with Jack aren’t a flash-back, but instead a flash-forward! The ending scene where Jack and Kate meet at the airport and Jack thinks they made a mistake, that they never should’ve left the island at all, is fantastic! Either it really was a glimpse from the future, or, as suggested in many forums, it was only a what if-scenario on display, if they were all to be rescued by the ship Naomi came with. Personally, I think can be at least one of the alternative futures for them, given that certain things would happen and that certain decisions were to be made. It feels somewhat sad in a weird kind of way that they will actually leave the island and its secrets that we all have got so attached to, but at the same time it feels comforting with a future where they actually make it. Was it really a flash-forward? Jack mentioned his father twice, as if he were alive. His father was never seen, so it’s pretty easy to write off one of them as just desperately trying to get drugs, and the other as Jack just being drunk. Or it was all intentional, and Jack’s father is indeed alive again! It has also been suggested that all the time on the island is actually the flash-back, and that the part with a bearded Jack is now, real time. Mind-blowing! Who was the guy in the coffin? It is suggested that it is a he, so I initially thought it would be Ben or Locke. But, Locke most likely stayed put on the island, and if Ben was forced to leave it, Jack shouldn’t be surprised that no-one else showed up. Which, in turn, suggests that more people who knew the person should be back from the island, not just him and Kate. So, who could it be that Jack wasn’t a friend with nor family to? Sayid? Hurley? Sawyer? Juliet?! Who was Kate going back to? I’d say Sawyer. Why not? Were they rescued at the end? Impossible to tell, but it seems like one likely scenario, given the flash-forward. The other option is that they stay, join the Others and fight the newcomers. Are Ben and the Others actually the good guys compared to the alternative? Most likely, I hope that their drive and ambition is something good, in the name of the island. It also gives the story potential to evolve a lot more in the upcoming seasons. I can’t imagine anything else. I guess he’ll be back to do flashbacks and such, but he’s not one of the survivors anymore. How come Penny’s transmission reached Charlie? I’ve read many people wondering and trying to make a connection between the buttons Charlie pressed and Penny showing up on the screen. To me, it’s pretty basic: Charlie turned off the jammer, and a signal (Penny’s) which had tried for some time finally got through. Easy as that. I have no idea, but I loved the episode and the part with him. I also really like the suggestion that he’s the soul of the island, or something to that like. Believe it or not, but next season actually isn’t scheduled to start until February 2008! I mean, come on! That’s eight frickin’ months away! It is announced that there are three seasons left, and that they will each consist of 16 episodes. Each season will be broadcast between February till May each respective year. To me, the time lapse will really damage the series, with a three-month long season, and nine months wait in between them. Charlie didn't just die. He met death face-to-face with a smile. On top of all that bravery, he even managed to warn Desmond that it wasn't Polly's boat. What can I say, the character got a suiting goodbye. Loved the 5 high points he handed to Desmond, too bad the paper got soaked when he dived. Also, when James (sawyer, should we still call him that? haha) shot Tom and said it was for taking the kid in the boat I jumped in joy! Seemed like everyone had forgotten all the bad things those guys have done to them. To me, the last half of this season was very well written, much better than season 2 (it was still pretty good, just not as good) and half of the 3rd. The ending was… fitting. Excelent. As for the rescue thing… My view is that they weren't saved. More like, something happened. I'm with Ben. He was indeed telling the truth and the people on the boat aren't there for good reasons. I'm guessing some sort of kidnapping/coercion takes place and they are forced to leave the island. Jack, Kate, …? But most of them are left behind. That's why Jack is saying they have to find a way to go back. To save the rest or to go back to their lives in the island. I don't see Lock ever leaving the island, though. Not ever. I do agree with you. February? Are they crazy? And for 16 episodes only? Do they want to leave time for other side projects? There are a lot of actors/actresses in the bill… filming this show still takes a big portion of their time, i guess. I think Naomi maybe one of the mysterious Dharma. This time Ben tells something right, they should not call Naomi's ship. I too think Dharma is connected to Naomis ship. I found this season rather disappointing compared to the other. Too much time-streching to avoid moving forward. Let's hope the next season will be more on-the-point. Wow, thanks for a long comment! I generally agree with every thing you mentioned! Interesting thoughts! Naomi might be Dharma, Ben is likely right and yes, I also wonder how long the show will make it. With the new schedule I'm pretty afraid it will hurt the popularity and life-length of the series. I can somewhat relate to your frustration. At times, it didn't go forward at all, but I believe the finale made it leap forward! That's how I see it going (bound to be wrong tho). One thing you seemed to have over looked Robert is that the "flash-forward" is not in order (sine of a Desmond premonition). Jack tells the head doc guy that his phone is broken (when he says that he left him three voice mails), but then at the end he uses it to phone Kate. Very interesting! It might indeed be a Desmond premonition. I've seen the ending again and I think you right. I forgot that he showed Kate the peace of new paper. I was thinking that they where talking about a different funeral and that the coffin was Kates (would explane why no family showed). Also noteiced that he had that plaster on his forhead that he got after he was on the bridge (thought he was thinking about suicide because of Kate dieing). So I'm back to having no ideal lol.